No one made a greater mistake than he who did nothing because he could only do a little. Brian Yablonski, Chairman of the Florida Fish and Wildlife Conservation Commission (FWC) was recently compelled to publish an editorial entitled “The Hunter Conservationist Paradox”. In response, I thought it important to dispel some myths and to present a true and accurate portrayal of the man known as the “Conservation President”; as well as some of his protégés. Perhaps some people should take notes as to what true conservation is. Mr. Yablonski’s most recent piece was submitted as a celebration of Theodore Roosevelt’s 157th birthday and his conservation legacy. This editorial was published on the FWC website five days after the first Florida black bear hunt in 21 years, and was in obvious response to the public criticism of the FWC decision to host this hunt. It was also intended to pay tribute to the one we know as the conservation President. “The Hunter Conservationist Paradox” summarized the conservation accomplishments of this great President; who at 42 years of age became the youngest President to reside in the Executive office. After a lengthy childhood battle to overcome severe and debilitating asthma, President Roosevelt eventually became the 26th President of the United States, following President William McKinley’s assassination in 1901. “Hunter as conservationist” has long been the first line of defense presented by hunters when challenged with the question as to why they hunt. With the plethora of grocery stores and fresh markets that are abundant today, the conservation argument long ago replaced the “hunt to eat” defense. And while most people would agree that hunting to eat is a justifiable reason for this activity, the connection between conservation and hunting is a more complex one. However, making a generalized assumption that all hunters are conservationists is as dangerous as stating that all Southerners are dumb (thank you Hollywood and the “Dukes of Hazzard”); all Northerners are rude and all Californians are laid back. I know many intelligent Southerners, many pleasant Northerners, and many Californians who are stressed out. And it was Alexandre Dumas who said “All generalizations are dangerous, including this one”. There is no question that the hunting community contributes to conservation via license and permit fees and federal duck stamp purchases. But, is killing off a particular bird or animal due to a perceived shrinking of habitat, or a food shortage, all in the name of conservation truly conservation? I can argue, but will leave that up to the reader to make his or her own conclusions. Do hunters improve the gene pool by killing the weakest and oldest? If they targeted the weakest and oldest, then this might be a valid argument. 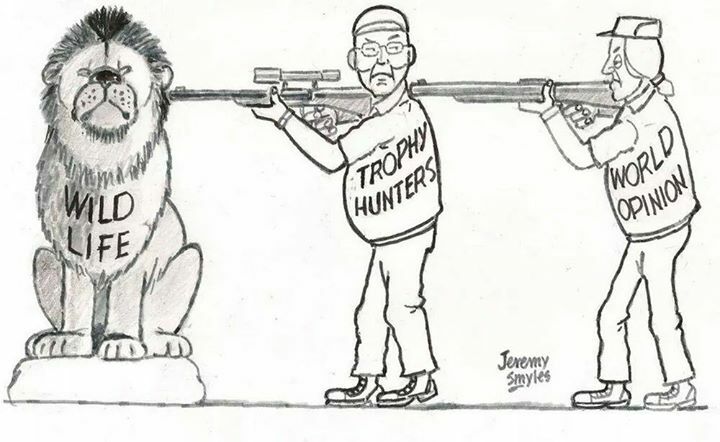 But, the reality is that the trophy target is the lion with the darkest mane, the elephant with the longest tusk and the rhino with the longest horn. 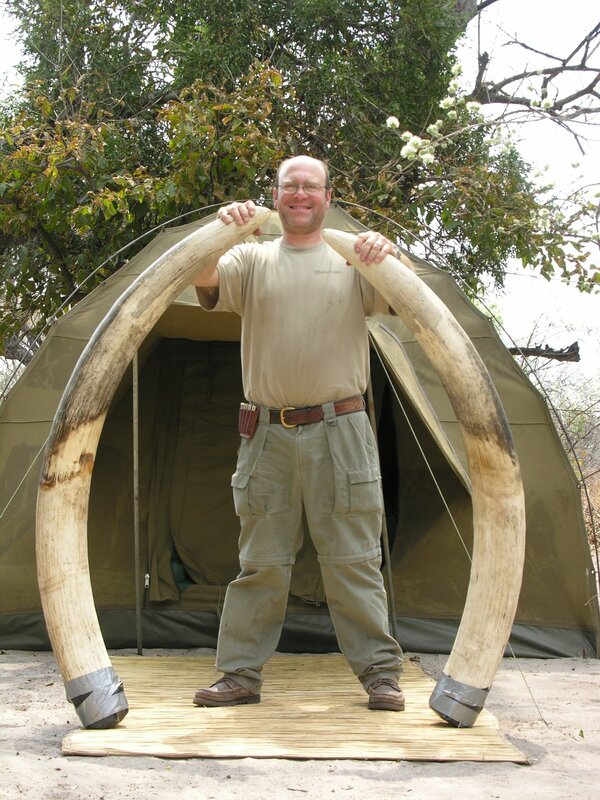 Hunters brag about killing the 500 lb. Florida black bear, not the 200 lb. black bear. Studies have shown that today’s African lion has a smaller, lighter colored mane. (The dark manned lions have become rare.) The average elephant tusk is smaller, as is the rhino horn. Hunted animals in general are smaller today, because the gene pool is weakening, not strengthening. This is the handiwork of man, not nature; and it clearly is not conservation. However, let’s be clear. This is not a condemnation of all hunters and all hunting. Hunting for sustenance is not subject to debate in this article. Hunting when there is no possible threat of extinction, or risk to the survival of the species is not part of this conversation. Some people will disagree, based simply on ethics and morals; and that killing an animal for the sake of killing is wrong. And while I am in that camp, those are my ethics; my standards in how I live my life. The standards that mold and guide others may be different from mine. And truthfully, that probably makes neither of us right or wrong. Now that we have established the ground rules, let’s discuss the crux of this “Paradox”; and how the significance of President Roosevelt’s contributions as a late 19th / early 20th century “hunter conservationist” is relative to today’s hunter who also touts the same hunter conservationist mindset. This teddy bear story captures the true character of Roosevelt (Teddy or TR), and few would argue that this in itself sets him apart from many hunters of today. With the proliferation of canned hunting, or “high-fence hunting” because canned hunting has such a negative connotation (don’t be confused…it is exactly the same thing), much of 21st century hunting is no less cruel than tying a bear to a true. The only difference is that TR refused to kill his bear. Is this one isolated story enough to establish Roosevelt as a conservationist, or a hunter conservationist? No, but TR also established nearly 230 million acres of land under federal protection. 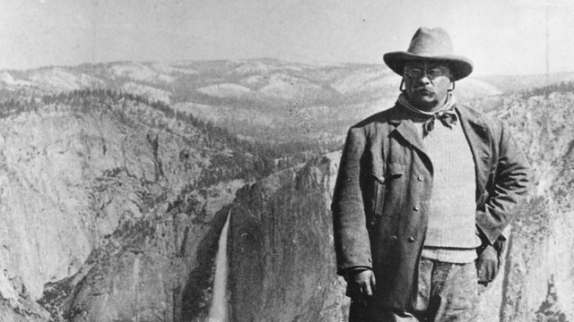 He established 150 national forests, 51 federal bird reservations, five national parks, and 18 national monuments. And one of his first notable domestic moves was the National Reclamation Act of 1902, which established irrigation projects in the west. The famous Smithsonian – Roosevelt African Expedition of 1909 covered 2,500 miles of British East Africa and Anglo-Egyptian Sudan terrain over an 11-month period, where 11,400 animal and plant specimens were collected, and would become what we now know as the Smithsonian Natural History Museum. 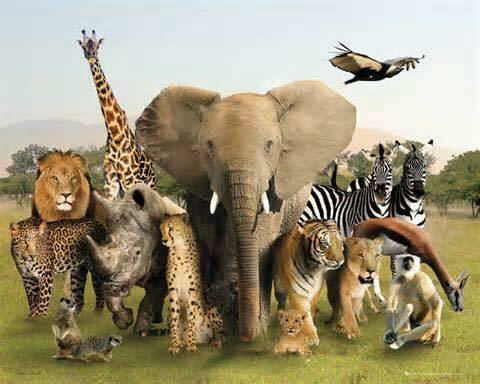 Granted, many will detest that those specimens included lions, leopards, cheetahs, hyenas, elephants, buffalo and rhino. However, this collection process was spread over a year’s period and over many geographical regions, to minimize the environmental impact of this expedition. And while this expedition did involve the killing of many animals, the underlying purpose was science, study and education. The African lion has been proposed to be designated as a threatened species by the US Fish and Wildlife Services (FWS) since 2011, and although the lion’s population has shrunken from 300,000 in Roosevelt’s time to an estimated 20,000 to 25,000 today, the FWS still has not granted this designation, which is a story onto itself. However, few would question that any species experiencing that dramatic of a drop should raise significant concern for their survival. Yet, how many hunters have put down their rifles in an effort to protect the survival of the species and picked up a camera instead? Quite the contrary, actually. Even with the serious decline of the African lion population, trophy hunting of this majestic creature has only increased in recent years; not decreased. Roosevelt also emphatically emphasized the importance of protecting all resources. “I recognize the right and duty of this generation to develop and use the natural resources of our land; but I do not recognize the right to waste them, or to rob, by wasteful use, the generations that come after us. It is also vandalism wantonly to destroy or to permit the destruction of what is beautiful in nature, whether it be a cliff, a forest, or a species of mammal or bird. Here in the United States we turn our rivers and streams into sewers and dumping-grounds, we pollute the air, we destroy forests, and exterminate fishes, birds and mammals — not to speak of vulgarizing charming landscapes with hideous advertisements.” This man was a true conservationist; and few, if any, question that. Mr. Yablonski also mentioned several other notable “hunter conservationists”, including Aldo Leopold, Ding Darling and George Bird Grinnell. And there is no question as the conservation contribution that these individuals have also made. Aldo Leopold was considered by many as the father of wildlife management and of the United States’ wilderness system. And early in his career, Aldo Leopold was assigned to hunt and kill bears, wolves, and mountain lions in New Mexico. Local ranchers hated these predators because of livestock losses, but Leopold came to respect the animals. He developed an ecological ethic that replaced the earlier wilderness ethic that stressed the need for human dominance. And rethinking the importance of predators in the balance of nature resulted in the return of these apex predators to the New Mexico wilderness areas. He was quick to criticize the harm inflicted to natural systems, out of a sense of a culture or society’s sovereign ownership over the land base – eclipsing any sense of a community of life to which humans belong. Clearly, Leopold’s vision and recognition of the importance of apex predators such as the bear, wolf and mountain lions flies in the face of those hunters that hunt these animals for sport, or because they are deemed to be nuisance animals. Jay Norwood “Ding” Darling was a Pulitzer Prize winning American cartoonist and was directly responsible for securing some $17 million for wildlife habitat restoration. He established the Migratory Bird Conservation Commission and made great strides toward bringing hunter and conservationist together. He also pioneered leadership in the field of proper game management. Darling initiated the Federal Duck Stamp Program, which uses the proceeds from the sale of duck hunting stamps to purchase wetlands for waterfowl habitat. Darling is largely responsible for the establishment of the network of game refuges in the country today, Darling was called “the best friend ducks ever had.” He also liked to remind overzealous developers that “ducks can’t lay eggs on picket fences”; and few would question his contributions to conservation. Ding Darling illustration. Interesting perspective on hunting. George Bird Grinnell was prominent in movements to preserve wildlife and conservation in the American West. He wrote articles to help spread the awareness of the conservation of the buffalo. He lobbied for congressional support for the endangered American buffalo. In 1887, Grinnell was a founding member, along with Theodore Roosevelt, of the Boone and Crockett Club dedicated to the restoration of America’s wildlands. Grinnell was also credited with single-handedly saving the American bison from extinction…a true conservationist. And although Mr. Yablonski’s article only referenced Roosevelt, Leopold, Darling and Grinnell, there are several other hunter conservationists that are also due a mention. John James Audubon was notable for his extensive studies documenting all types of American birds, and for his detailed illustrations that depicted the birds in their natural habitats. His major work, The Birds of America (1827–1839), is considered the finest ornithological work ever completed. He also identified 25 new species of birds during his lifetime. 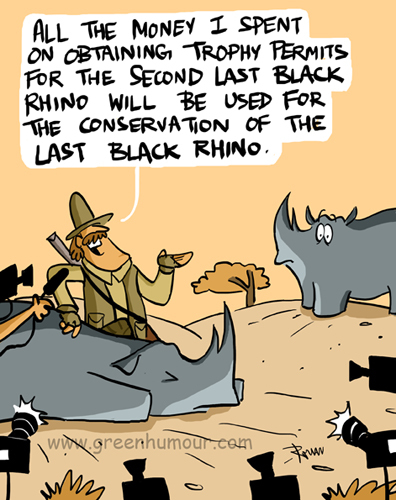 He too qualifies as a true conservationist. Charles Darwin, through his collection and study of species, noticed similarities among species all over the globe, along with variations based on specific locations; leading him to believe that they had gradually evolved from common ancestors. He came to believe that species survived through a process called “natural selection,” where species that successfully adapted to meet the changing requirements of their natural habitat thrived, while those that failed to evolve and reproduce died off. Lewis and Clark provided valuable information about the topography, the biological sciences, the ecology, and ethnic and linguistic studies of the American Indian, and the mysteries of the vast area known as the Louisiana Purchase quickly disappeared after Lewis and Clark completed their journey. The famous 19th and 20th century conservationist hunters above set aside millions of acres of land to protect forests, rivers, mountains, and wildlife. They saved the buffalo from extinction. They established a national network of game refuges. They rethought the importance of apex predators in the ecosystem. They provided us theories on evolution. They provided us with the greatest ornithological work ever completed. So, how does this compare to the hunters of today? Today’s so-called “conservation” hunters include Corey Knowlton, who recently paid $350,000 to kill an endangered black rhino. They include Ted Nugent, who just refers to people against hunting as “stupid” because no one should question this activity. 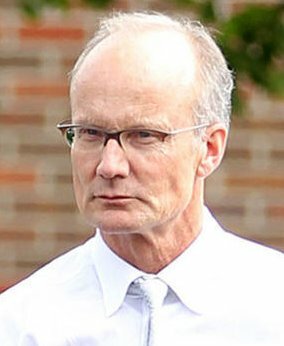 We have Dr. Walter Palmer who illegally killed a black bear in one Wisconsin county and dragged his body 40 miles to another county, where the killing would have been legal. He offered three different hunting guides $20,000 to corroborate his story. They didn’t and he admitted guilt. In July 2015, he illegally killed the iconic Cecil the Lion after Cecil was lured from Hwange National Park onto private property. And most recently, he was videotaped driving his pick-up truck along the boundary of his property, allegedly in an effort to keep deer on his property so that he could shoot them. We have hunters that participate in canned hunting expeditions, where lions and other animals are raised by humans for the sole purpose of being killed. They are trusting of humans, often sedated for an easier kill, and hunters are virtually guaranteed of a kill. Hmmm…So, is it just me, or does the modern-day hunter as conservationist fall just a little short when measured against these great men that Mr. Yablonski mentioned in his editorial? Or perhaps it is simply that Roosevelt, Darling, Leopold and others truly were “hunter conservationists” and today’s version is simply a hunter? That seems about right. I’m glad you asked, because TR did indeed have an opinion on this. 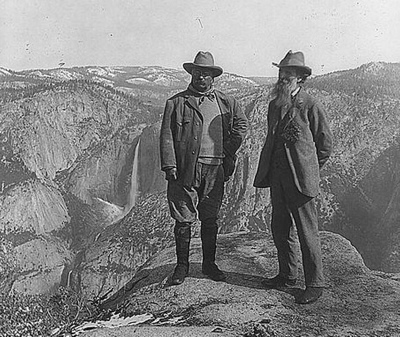 The great naturalist, John Muir, was referenced by Mr. Yablonski as having spirited debates with President Roosevelt, and that one of their meetings inspired Roosevelt’s “aggressive approach to protecting American landscapes and wild treasures for future generations”. He also noted that Muir recognized and accepted the hunter conservationist paradox personified by Roosevelt. While Muir certainly respected TR’s opinions and there is no question that those campfire meetings had a profound effect on President Roosevelt, I question where Mr. Yablonski’s obtained the information that Muir “accepted” the idea of hunter as conservationist. This is found nowhere in my research of Muir. Rather than asking if today’s hunter is truly a conservationist, perhaps the more appropriate question to ask is whether the term “hunter conservationist” even exists? Certainly, someone can be a hunter and someone can be a conservationist; and Roosevelt has proven it possible to be both, but not necessarily at the same time. I can capture my travel adventures through the view of a journalist and I can capture my travel adventures through the view of a camera. But, I can’t do both at the same time. I am either photographing or I am writing. You are either destroying (killing) or you are conserving. It can’t be both. Comparing the conservationist efforts of today’s hunter to Theodore Roosevelt and other great conservationists is like comparing me to Neil Armstrong because he walked on the moon and I had a glass of Tang. And until Corey Knowlton establishes a national park to protect our wildlife; or Ted Nugent implements a revolutionary strategy to save the African lion or leopard from extinction, we should leave Theodore Roosevelt out of the conversation. 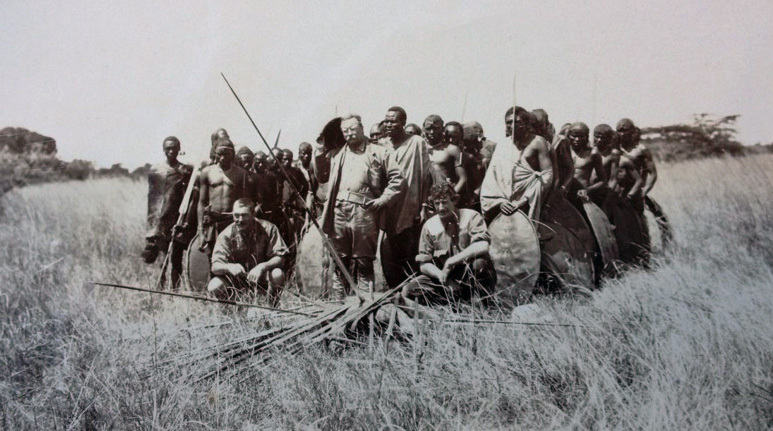 Finally, the great men discussed in this article made their conservation contributions in the late 1800’s and early 1900’s; a time when few species faced the same level of vulnerabilities and threats of extinction that our wildlife faces today. Times have changed; and just because something was acceptable a hundred years ago, doesn’t mean it is acceptable today. 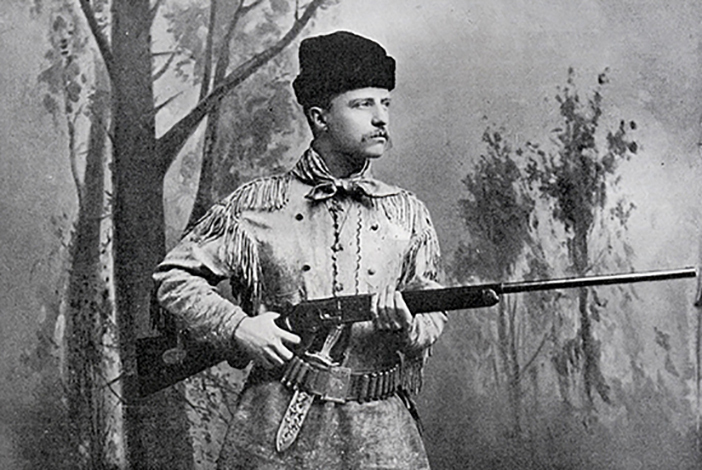 I believe that if Teddy were alive today, he would be incensed that people would dare compare him to the modern-day hunter; and to suggest that the modern-day hunter shares the same conservation values that he possessed. There simply is no comparison. “I am an expert witness because I say I am. I will testify for you, I’m a gun for hire, I’m a saint, I’m a liar. Because there are no facts, there is no truth; just data to be manipulated. I can get any results you like. What’s it worth to you? The simple fact is, the populations of these beloved creatures are dwindling, and dwindling quickly. This particular article was one I started to write several months ago, but wasn’t quite sure the path I wanted it to follow. Originally, I envisioned this as a follow-up to “Agent of Change” and “Riding the Wave of Change”. However, as any artist will attest, when the creative juices aren’t flowing toward that idea, you can’t force it. Put it away, and sooner or later, the timing will be right, and I find that time to be now. So, three months ago, the tragic story of Cecil the Lion erupted into national and world news. Cecil was mortally wounded on July 1st; but it was not until July 26th that his story first appeared in social media pages. Three months later, Cecil continues to generate a myriad of strong and passionate emotions. And while Cecil is no longer headline news, if you listen carefully, you can still hear the steady and slow beat of the war drum off in the distance. Dum…Dum…Dum…not unlike the classic Hollywood westerns. Cecil may no longer exist in the physical realm, but his spirit projects that slow steady drum beat that continues to inspire his supporters to fight the cause of those that cannot speak for themselves. I believe it is safe to say that the hunting community was initially caught off guard as to the passion and drive of a re-energized anti-hunting movement. And while there were, and are, a number of people who questioned why Cecil was a story at all, public opinion could best be described as shock, anger, outrage, a demand for justice, and a demand for change. However, what caught the hunting establishment off guard was not necessarily the traditional animal rights activists and the well-known animal welfare organizations. They have been battling the hunting establishment for years. No, the surprise was that this anger was coming from the main stream. And of course, that is their greatest fear. Historically, the hunting establishment has often been able to pass off animal activists as extremists; as people with a love for animals that exists beyond a rational behavior. And unfortunately, even though this is an unfair and very untrue statement, this argument has been bought and sold many times. And from first-hand experience, I know that many within the mainstream did not always believe the narrative of the animal rights activists. They just could not believe that humans were even capable of this type of activity or behavior, and that the story told must be a gross exaggeration. Then Cecil opened up the proverbial “can of worms” and suddenly mainstream had no choice but to acknowledge man’s capabilities of the senseless killing of defenseless animals. As they dug deeper into the subject, they realized it was even worse than they could have imagined…canned hunting and other extreme acts of animal abuse. And once the general public becomes outraged and demands change, it becomes almost impossible to stop the momentum. Knowledge is power, and power begets change. Unfortunately, as animal rights activists will argue the cruelty of hunting and the unethical and immoral facets associated with this sport, the pro-hunting community will argue hunting as a mode of conservation; and that it is naturally engrained in the human psyche to hunt. Hunting appears to be one of those subjects that is so divisive, it truly “draws that line in the sand”. It is a dare of debate; and not a friendly and spirited debate that concludes with both sides shaking hands and wishing each other a nice ‘rest of the evening’. And in fact, if one side did extend a hand in friendship, the other side would be suspicious as to what weapon is hidden in the other hand. Yet at the same time, this is a subject that people must engage in active communication and debate, because the end result of this will have far-reaching consequences not only in our lifetime, but in the lifetime of our children and grandchildren. The crux of the issue is not just survival of these magnificent animals; but an environment in which they flourish and are not constantly facing “threatened” or “endangered” classification, or worse, extinction. It is a sure bet that 99.99% of the animal rights groups would like to see every animal that is currently either threatened and endangered to be restored to a healthy sustainable level. At the same time, it is also a safe bet to assume that 97.5% of the hunting community also desires sustainability above threatened level – at least for certain animals. Unfortunately, this solidarity stops there because survival of these species has a very different meaning and very different intent for the two groups. Animal advocates have a fundamental belief that animals have as much right to exist on this earth as humans. They have beating hearts, they have souls, they have feelings, they have emotions, and killing for the sake of killing is a cruel and inhumane sport. It is immoral, it is unethical. The act lacks complete compassion and is contrary to us as stewards of our planet. The pro-hunting group desires a healthy animal population; but only to ensures an ample supply of trophy opportunities. Aside from the sample size of the population that hunts deer or elk, or similar game for food, the remainder of the hunting population simply has an insatiable desire to hunt…to kill. Obviously, the fact that the two groups are polar opposites when it comes to the “trophy” animals (Have I mentioned that I hate that word?) is in itself the reason that line of demarcation is drawn. However, I believe it is more than that. The manner in which the trophy hunter touts his kill naturally generates this seething anger and venomous hate from the animal advocates directed at the hunter. The triumphant pose in a dominating position over their lifeless victim, or holding the animal up for a photo opportunity, and always exhibiting an ear-to-ear grin…as if this activity marked the highlight of their life. This over the top behavior is sure to spew hatred. I compare this to a football game and the fan reaction when the opposing team scores a touchdown. If the wide receiver simply returns the football to the referee or perhaps engages in the basic spiking of the football, the fan’s reaction is generally limited to disappointment and maybe some frustration. However if that same receiver appears to be promoting his second career as a Broadway dancer wannabe, engages in a celebratory touchdown dance ritual, and attempts to show up the opponent, the fan tends to be a little more expressive of his feelings. If these photographs of hunters in their celebratory poses were not circulated widely, and did not appear on social media pages, the anger and outrage toward the hunting community would be substantially lessened. The “pose” has essentially become a middle finger extension to the animal community, and certainly has added fuel to the fire. Additionally, I would surmise that if the hunting community was more honest and simply acknowledged that this desire to hunt as just that…a desire to hunt, at least some within the animal community might have a tad bit more respect for this activity. However, when hunters attempt to justify the act with buzz words of “conservation”, “weeding out the weak and the old” and that they are doing it to help feed the villagers, this does nothing but generate more anger and hostility. So, let’s simplify this entire discussion and make it as crystal clear as it can be. The hunter trophy hunts because he (or she) likes to hunt. Period. Now, there is certainly a driver behind this hunting passion. Maybe it truly is related to a less than average appendage, or another biological shortcoming. Maybe it is related to an inferiority complex, or some other shortcoming. Maybe it is something handed down from generation to generation. Perhaps there are some hunters that truly believe that hunting provides an overall environmental benefit. Maybe the hunter feels a need to project his power over something, and in that regards, I guess killing an animal is better than beating his wife and child. And while I attempt to give these trophy hunters the benefit of the doubt and to come up with a justifiable reason for hunting, I draw a blank. I hear some of the reasons (“I love animals so I shoot them.” or “The kill is just a small part of the entire experience.”), and they don’t make any rationale sense. I could easily write an article entitled “Why I Hunt” and just leave the page blank. It pushes my limit to grasp the understanding of a hunter that states it is the love for animals that drives the hunter to kill the animal. That is no different from me saying that I love Lamborghinis, so I can’t wait to buy one so that I can crash it into a wall. True love is not stalking and it is not controlling. It is appreciating something or someone for whom or what they are; not trying to change them or own them. And killing something or someone definitely is not indicative of love. But the true crux of the debate always seems to come back to the issue of conservation. Hunters tout that they are better conservationists and do more for lions and other wild animals than the animal loving / anti-hunting community. But, how does one define conservation? According to the dictionary, conservation is defined as “the action of conserving something; in particular, preservation, protection, or restoration of the natural environment, natural ecosystem, vegetation and wildlife.” The hunting community’s definition of conservation seems to only focus on “restoration” for the sake of killing. This explanation suggests that hunters spend a significant sum of money for the right to kill these animals, and that money in turn is invested into the local economies. That local investment will encourage the local community to protect the lions and leopards and help them to view these animals as revenue sources rather than livestock threats and their way of life. And the second part of this argument is that by targeting and killing the older and weaker animals, this ensures survival of the species. Okay, I get it. In theory (a word that needs to be triple underscored, bolded, italicized, quoted and in a 48 Font), this has some validity. As much as the rest of the world loves the beauty, grace and awesomeness of the majestic lion or the leopard or the elephant, many of the African natives simply see these creatures as a nuisance; damaging and destroying crops or livestock or threatening human life. It is difficult for us to put ourselves in the position of these simple farmers and ranchers. However, if you have ever had a squirrel in your attic, or a neighbor with a dog that barks all night along, you can somewhat understand this attitude toward these wild creatures. So, if the local community was a benefactor of this hunting revenue, that money could be invested in fencing to keep the lion or the elephant away from the crops. It could be an incentive for the local people; that rather to shoot or poison the animals, to actually look after them. Or the money could be utilized to hire additional rangers to fight off the poachers. Unfortunately, the fact of the matter is that this money does not make it down to the community levels; and if it does, it is such a nominal amount, it accomplishes none of the above. There have been a number of studies on this subject, and only about 3% of the total hunting revenues actually benefit the local communities. Perhaps this has to do with the amount of corruption existing in many of these African countries. If the government leaders operated more honest and open governments, more money would funnel down to the local communities. Unfortunately today, that revenue is no more than an occasional drip of a leaky faucet. Theory is not reality. It does not work. The hunter also suggests that he (or she) must take a God-like role in nature, and that somehow he (or she) is playing the hero because he targets the old, the weak and the sick. And in doing so, this strengthens the remaining herd and ensures its survival. Well of course. Eliminating the old, weak and sick does help preserve the remaining herd; because this is exactly what nature does and the ecosystem quite frankly, does not need our help. It operates perfectly without us. Within the lion community, the male lion will run a pride until he is usurped by a nomadic lion who has challenged his authority. He will beat either back the challenger and continue to rule, or the nomadic lion will prove the stronger; take over the pride; and the older, male lion will be banished from his rule. At that point in time, he will live out his remaining years in isolation or perhaps team up with another nomadic lion and jointly challenge leadership of another pride. 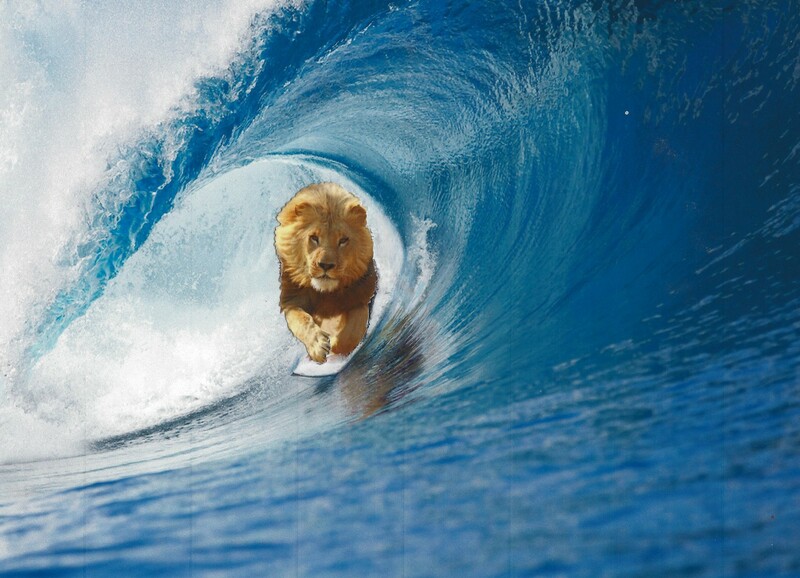 Charles Darwin’s “survival of the fittest” theory is clearly at play within the lion community, as with all other animals in the natural world. The oldest, sickest, and weakest will be left behind and will die through natural causes. This may be difficult for us to accept, because we feel compassion for those who are sick and frail and elderly; and generally, we take care of our weak. While animals also have compassion, the animal species also has an innate understanding that the entire species will be under constant threat of survival if the weak and sick are not weeded out. This is how the ecosystem was designed and quite frankly, without man in the mix, it works perfectly. There is not a need for the hunting community to insert themselves into this process. Additionally, how many hunters, if completely honest, would agree that they seek the largest rack, the largest mane, the biggest tusks…not the smallest rack, the smallest mane, and the smallest tusks. Targeting the old, weak and sick is completely contrary to the “thrill of the hunt” and the adrenalin and emotional highs that supposedly drive this sport. This argument is completely without merit and needs to be eliminated from the conversation entirely. 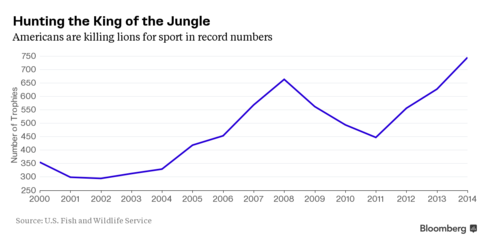 If there needs to be final “nail in the coffin” proof to the fact that the hunter is not a conservationist, this may be answered in an article that was just published by Bloomberg Business.com entitled “Lion Heads Arrive in Record Numbers as U.S. Considers Crackdown”. As the African lion population continues the dramatic and downward spiral, the US Fish & Wildlife Service has been pressured to designate the lion as a threatened species, if not endangered status. We will not get into the details as to why the US FWS has dragged their feet for so long on this issue, or the fact that certain US FWS officials are too closely aligned to Safari Club International and other hunting organizations to effectively govern without an obvious conflict of interest; although this certainly would be an eye-opening subject to expose. Very shortly, the US FWS will be making this determination, and threatened species status would effectively make it illegal to transport any part of the lion into the United States. Although this act would not prevent a hunter from hunting lions, he would no longer be able to transport the trophy into the country. And given that approximately 60% of lions killed in Africa are killed by U.S. citizens, ban the shipment of lion trophies, and the number of hunters making that trip to Africa will drop significantly. 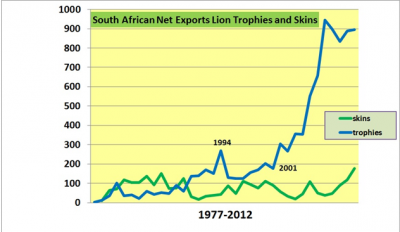 But according to this article and the US FWS, Americans imported a record 745 African lions as trophies in 2014; up 70 percent since 2011 and more than double the total in 2000. This simple and succinct statement sums it up. The hunter cares nothing about conservation. The hunter cares about his trophy. That’s it. Certainly, if hunters were concerned about the plight of the lion; rather than intensifying their efforts to go shoot one, they should be voluntarily backing down and giving the lion population an opportunity to recover. This is the opposite of conservation. The bottom line is this: the population of the big cats has dropped significantly in the last 50 years; and at the current rate, they will all become extinct. And to be fair, aside from natural factors such as disease and starvation (which should have a nominal bearing on the overall species count), poaching and loss of habitat are probably bigger contributors to the population loss than hunting. That said, losing 600 to 700 male lions every year to trophy hunting is a statistic that cannot sustain this population. Hunters will continue to argue themselves as conservationists. However, there is one very simple way of proving this. Ban all trophy hunting activity for a period of five years. At the end of that five-year period, let’s take a look at the lion, leopard and cheetah populations. 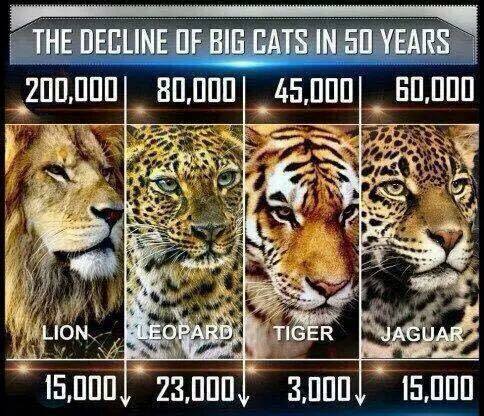 If these populations have continued to decline at the same rate, this will prove that trophy hunting does not have a negative impact on these animals. However, if these species show stabilization and recovery, then this proves otherwise. Something tells me that the hunting organizations will never go for this idea because they already know what the answer will yield. What do you think? It should really come as no shock that the Zimbabwean government announced on Monday that they would no longer seek extradition of Walter J. Palmer for the illegal killing of Cecil the Lion on July 2nd; nor attempt prosecution of the alleged act of poaching. If anything, the biggest surprise is that it took this long for them to make this decision. Of course, it is worth noting that had Zimbabwe not dropped these charges, the U.S. Department of Justice was still not obligated to honor the Zimbabwean government. And despite the efforts of millions of petitioners to pressure the U.S. Fish and Wildlife Services and the Department of Justice to seek justice for Cecil, many never believed this would actually happen. The current extradition treaty between the United States and Zimbabwe went into effect in 2000. However in the 15 years since, there still has not been a single American sent to Zimbabwe to face charges. And LionAid makes a strong point. Would you want to test extradition and prosecute for an act that would negatively impact future hunting revenues? Profiteering should not be the guiding principle in this issue, but in today’s world, that is often the sole consideration of governments and businesses. It is why this world is in the condition it is today, but more on that lengthy subject at a later time. What one must remember is that Zimbabwe is not exactly the poster child of honest government. And even if they did pursue prosecution, the U.S. government might deny the extradition request, out of fear and concern that Dr. Palmer would not receive due process. Of course, public opinion would yield little sympathy for Dr. Palmer, and many have had a view-point of an eye for an eye to avenge Cecil’s death. And believe me, I have no sympathy for the man either. However, if anyone has ever watched the program “Locked Up Abroad”, they would certainly respect and appreciate the fact that the U.S. government would vet the rights of American citizens; and to ensure that if extradition did occur, there would be some guarantee of due process. The primary intent of the Lacey Act is to prevent protected species from being imported into the U.S. However, wildlife expert Eric Freyfogle indicated that he could still be prosecuted regardless of whether the remains of Cecil were imported. So, perhaps this does not quell the feelings of anger and outrage that many still have regarding Cecil’s death. They still want vindication and revenge and justice to be served. For that reason, I offer you Exhibit A. The photograph on the left is one of Dr. Palmer, obviously taken in his dental office and prior to the Cecil controversy erupted. The photograph on the right is a recent photo that was posted with the Zimbabwean announcement. Dr. Palmer is apparently 55-years old. However, would you not agree that the man on the left looks dramatically older than the man on the right, by at least 20 years? I’m not going to mince words. The man looks bad. So for anyone to suggest he is walking away from this tragedy completely unscathed, he isn’t. And, if you believe there is such a thing, it looks karma has a little say so here. I have emphasized all along that regardless of the legal action or inaction in Palmer’s case, his life has changed, and not for the better. Aside from the stress that has clearly impacted his health, here is a man who for the rest of his life, will be looking over his shoulder. Not necessarily fearful that someone might take ‘eye for an eye’ literally, although there are probably some people out there that given the opportunity, might consider it. Everywhere he goes…to his dental office, to the gas station, to the grocery store, to a restaurant or shopping, he will be fearful that someone will recognize his picture and blurt out “Murderer” or maybe they will announce his anatomical shortcomings to anyone within ear shot. His business will be impacted because every patient now knows that each dollar earned is a dollar designated for the next Cecil trophy. He may even find a lack of allies within the hunting community, as his story has exposed much of what that industry has worked hard to keep below the radar. Safari Club International revoked his membership. Will they give it back? Perhaps, but they likely feel greater wrath from the general public than they do now. So, it is very possible that they will distance him from their organization, for fear of more negative publicity. Most people hope to leave this earth with a positive legacy. They hope to be viewed by others as someone who has made a positive contribution to this world; someone who left the world in better condition than when they entered the world. It may not matter to him; but any positive contributions he has made in his life will now be dwarfed by Cecil, and the two of them will forever be linked. William and Clark… Bonnie and Clyde…Thelma and Louise…Palmer and Cecil. 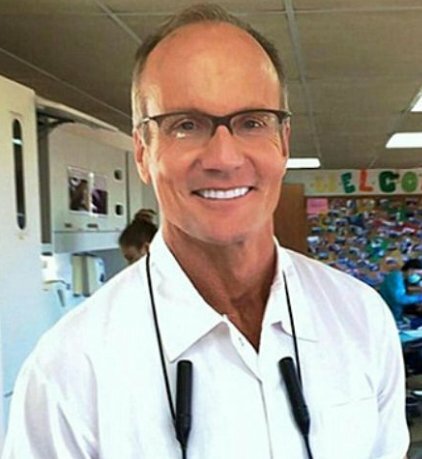 Five years from now say the word Walter Palmer and people will instantly conjure up Cecil’s name. His name is mud and it is unlikely that will ever change. Karma is the spiritual principle of cause and effect where intent and actions of an individual (cause) influence the future of that individual (effect), and when something does something bad, we always like to say that karma will have its revenge. And we often say that because we have no confidence in the justice system to be just and fair; or we say it about a cruel, inhumane or act that is deemed unethical or immoral, but not illegal. I believe in karma, but perhaps not the same way others believe in karma. Each of us is composed of energy. Every living being and even every material object is composed of energy. When we promote positivity, compassion and love, we project a positive energy. When we promote anger and hate, we project negative energy. My view of karma might be better defined as fitting within the framework of the Law of Attraction…simply meaning that we attract everything into our lives…positive and negative, good and bad. So, a life evolving around illegal and or unethical behaviors will attract like-minded individuals; and will also project that same negative energy into the universe, and thus, attracting more negative energy in return. We’ve heard it many times before: ‘You reap what you sow’. And even the golden rule of ‘Do Unto Others As You Would Have Them Done Unto You’ applies the same metaphoric definition of the Law of Attraction. I believe that Dr. Palmer will ultimately reap what he sows, as with the rest of us. I certainly believe that the general public’s outrage and response Dr. Palmer’s killing of Cecil is proof of the universe at work. Call it karma if you will. However, the universe may have a definition of justice that might not necessarily fit within the narrative as to how you view justice, or how I view justice. Yet at the end of the say, we may observe that justice indeed has been served, regardless of the method in which it was dished out. And a final thought. I originally described Cecil as the agent of change, and this decision by Zimbabwe not to pursue criminal action has not changed this view at all. Cecil’s death was a tragic event…but not anymore tragic than any other African lion that paid the ultimate price to a hunter with an over-sized ego. Cecil brought ‘center of the stage’ attention to an activity that those participants would have preferred to remain largely invisible to the world. Dr. Palmer is just a small pawn in a much larger game, and he should be treated as such. Originally, I felt that anger toward him that everyone else did. But in time, I realized that this that anger could be directed at something much larger…something more far-reaching. Cecil’s story expanded news of the lion’s plight beyond the animal welfare groups into the mainstream. Only 20,000 lions remain in the wild; and most people now know about canned hunting and lion farms. This is not the time to become discouraged and frustrated and conclude that because Zimbabwe will not attempt to extradite Dr. Palmer, this is just the sad end of Cecil’s story. It isn’t. Cecil’s tragedy is Chapter 1. The failure to prosecute is Chapter 2. We have many chapters still yet to experience. Those chapters include the passage of the CECIL Act, passage of the Big Cat Public Safety Act, and passage of the Rare Cats and Canids Act. They include the ultimate goals to stop trophy hunting practices…particularly of those animals on the threatened and endangered species list; and definitely a stop on canned hunting practices. They include solidifying and protecting the Endangered Species Act; and beyond just animal welfare, a hope that this might lead to a greater compassion in society. Perhaps you might say that this final goal is unrealistic and too lofty, but I will still choose to believe this. After all, karma is watching. Ask Columbia Theatre in WA to CANCEL the Tiger Show! Tell FOX and CBS tigers should not be exploited on television shows! ACTION ALERT! Ask a Florida law firm to stop exploiting a white tiger! Don't let the Big Cat Public Safety Act die on your watch!